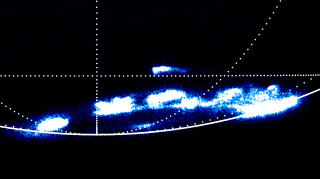 Ultra-violet Hubble Space Telescope image of the southern aurora on Jupiter. The most poleward patch of emission has been found to appear and fade away every 2-3 minutes. New Hubble photos show auroras – flares of ultraviolet light – streaming from the planet Jupiter. These light shows on the gas giant are similar in some ways to the northern lights on Earth, but there are important differences. "The big picture is that on Earth the magnetosphere is controlled by the solar wind," said astronomer Bertrand Bonfond of the Universite de Liege in Belgium and UCLA. "On Jupiter, we have a magnetosphere that is not that much affected by the solar winds, but by its rapid rotation and the material expelled by the volcanic moon Io." Solar winds are streams of charged particles that fly off the sun. When these particles collide with Earth's magnetic field, they create the brightly shining lights known as the aurora, which are seen at both poles of our planet. The auroras on Jupiter also occur at the poles. "Auroras usually appear as an oval curtain centered on the magnetic poles of the planet, but they are also composed of different features such as spots or diffuse emissions," Bonfond told SPACE.com. "Our study concerned some kind of spots located inside the main oval of Jupiter." Using Hubble's Space Telescope Imaging Spectrograph, Bonfond and his team made the longest sequence of high-resolution images of Jupiter's aurora ever. They noticed that the ultraviolet light in the aurora flared brighter every two to three minutes. "The quasi-periodic behavior these flares is very similar to the one of an auroral spot on Earth," Bonfond said. "Consequently, we think that they could be related to the same phenomenon, called magnetic reconnection at the front of the magnetosphere." The researchers say more data is needed to understand the complexities of Jupiter's aurora, and how it differs from that of Earth. The new study was detailed in the Jan. 28 issue of the journal Geophysical Research Letters.